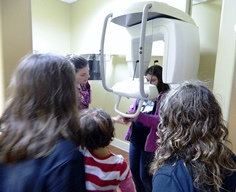 Dr. Littlejohn and Dr. Barbi offer field trips to Brownies and Cub Scouts to learn about oral health and orthodontics in a fun atmosphere. In addition, for the Brownie Quest Badge activity “My Best Self,” this completes Step 5: Meet a Health Helper! We’ll watch and discuss the key points of the ADA’s video Dudley’s Classroom Adventure. We’ll take a tour of our office, including a visit with Dr. Rod or Dr. Liz and a demonstration of what happens at a typical orthodontic appointment. We’ll provide instruction on proper dental health, care of teeth and gums, and how orthodontics works to create healthier smiles. And of course, we’ll visit our bistro for a snack! We’ll also give everyone a goodie bag to take home. Please contact us if you are interested in a future field trip opportunity. We look forward to welcoming your troop to our practice!